Whenever I talk with someone about how to start an online store or whether it’s a good idea for them, I think back to when we were still trying to figure it out for ourselves & how we were going to feed our family. You may not believe it but it was full on struggle bus when we started ALP & we were desperate, so if you’re in the same position of not knowing if you’re going to be able to buy groceries next week (or today), keep your head up! You got this. First off, how do you begin? With an idea – find a niche that you enjoy working in, whether it’s local services, virtual assistance, selling your artwork, dropshipping, social media management, or whatever it is you like to do, so long as that happens to be legal, and come up with a business plan. Who is your ideal customer & where do you find them? There’s a near certainty that your perfect customer is online & a very good chance that they’re on some online markets that you can use to begin as you work on how to start an online store (you see where this is going). Let’s use Etsy as our online marketplace example – at the time of writing this post, Etsy claims nearly 36 million active buyers. Think about that for a second – if you had a product that Etsy allows for sale on their platform that appealed to a tenth of that number, that’s a potential 3.6 million customers. It costs 20 cents to list a product for sale on Etsy & very little in terms of sales fees, so you could have your Etsy shop opened up in no time, set your tags to optimize your product for Etsy search results & wait for your clientele to start engaging with you. Of course it’s not going to be easy, is it? Etsy has some fierce competition with their 1.98 million sellers & Etsy shop owners can get pretty emotional with one another at times because they usually care deeply about what they’re offering & they don’t understand why potential customers might pass them by in favor of what appears to them as an inferior product. There are any number of reasons that might happen but one thing that people prize in the marketplace is service. It’s actually pretty easy to provide a much better customer service game than most competitors without disrespecting yourself by just treating your potential & current customers the way you’d like to be treated yourself. You don’t have to be pushy, sneaky, clever, begging, or anything like that … your customers are people just like you & they tend to prize the same kind of treatment. So keeping up the customer service & treating people like human beings will get noticed, especially in a place like Etsy, where they track customer satisfaction in a variety of ways. Your shop will be thriving & pretty soon you’ll find yourself in a position where you need to make a decision on what to do next … what to do, what to do? I know! Let’s get back to that original question of how to start an online store – let’s set up your own website! Yo dog, if business is doing that great why would I want to do that? Funny you should ask, we were in this exact position so I can tell you exactly why & it should give you enough pause to realize the genuine need for your own website – you don’t own your Etsy shop, they do. Regardless of the platform, Etsy, Facebook, Instagram, Pinterest, Poshmark, Reddit, etc. you don’t actually own your account, it’s owned by the platform & they can essentially do as they please with it, even if it means having a negative effect on your account. So you really need a website that you have complete control over to ensure the future of your online business because that’s the only place you have peace of mind. Our own Etsy shop has always done pretty well but when Etsy started making changes to their search algorithm to make it smarter by incorporating AI into it, our Etsy sales t a n k e d & if we’d not had our own website already set up & doing well in its own right, it would have been right back on the struggle bus instead of a bump in the road – we definitely weren’t the only ones, either, it was pretty widespread panic among Etsy shop owners when they were updating the system. We’ve since worked very, very hard to regain ground on our Etsy marketplace & have learned how to work with the fickle creature that it is in our own circle & to respond to changes as they occur. This begs the question of why you might want to start on a marketplace like Etsy in the first place, if they can affect your livelihood that dramatically and by accident. Education is the shortest answer – you need to learn the ropes for your own online marketplace activities & a platform like Etsy is perfect for that with its minimal operating costs, robust infrastructure, & great customer visibility. Once you’ve proven that it can work for your needs, you’ll have a lot of handy knowledge about how to operate online that you can put to work when you … start an online store! Your own this time, though. What type of online store should you open? It just depends! So what type of online store should you open? Where should it be? What platform should you use? Wix? Squarespace? Shopify? WooCommerce? The answer, of course, is … it just depends! It depends on your business needs & where you need to take your business once you venture out on your own. Maybe you need to offer product pins or to be able to easily & automatically sync your new products with your Facebook Shop, maybe you need to easily be able to offer subscription-based products, maybe you need to rank in local search results. You can do all of that & more on a variety of platforms & while we definitely have our own opinion & preference on this, we think it’s an amazing & exciting opportunity for you once you get to this point, almost like starting a new job! You might not believe it, but it genuinely makes my pulse quicken to think about starting a new venture like that – it’s so satisfying! Whatever you do & however you do it, we wish you all the success in the world & when the copycats come along & try to take a piece of your action, keep it classy! We offer White Label Design, too! Contact Us. My love affair with photography started when I was in high school — my junior year, to be exact. It’s a bit of a funny story, looking back on it. I took all honors and AP courses throughout my junior high and high school years. During my junior year of high school, I wound up with Photography as an elective. Ick! I freaked out about it, actually. It wasn’t an honors class, and it wasn’t an AP course, and I was really ticked off that the school would randomly choose this elective for me given that I’d signed up for additional courses that would be weighted differently than a regular ol’ course. I had to experience it for a few days, and my mom told me to keep an open mind before I tried to go to our guidance counselors to change classes. I loved it, though. It wasn’t so bad after all. We got to check out SLR cameras, buy black and white film, and we processed the film ourselves, and then did all of the darkroom processing, as well. I loved everything about it, so much that I signed up for Photography II and AP 2D Design during the rest of my time in high school. I had a love-hate relationship with my instructor. His name was Mr. O’Neal, and I think he passed away years ago. I knew that I was one of his preferred students. I also knew that he was going to be tougher on me, and I definitely had an attitude about it. On one assignment, he docked points for a reason that was beyond me — I challenged him on it, and pointed out that I met all of the design principles required for the assignment, and that art was totally subjective. I got those points back. Squeaky wheel gets the grease, I suppose! I had my first experiences with Photoshop and digital cameras in that class, too. The digital camera was like a freaking brick. It was huge, and heavy. And it’s so funny to think about that now, when you can put a bajillion megapixel camera in your back pocket. That’s where it all started. After that point, I had fallen in love with photography, and was always interested in the latest technology or subjects to shoot. It wasn’t until I was in the Air Force that I got my first DSLR and thought I’d make a go of a photography business. My first shoot was for a coworker, and even though she said she liked the pictures, they really sucked. Like, bad. BAD. But I kept at it, learned from it, did a lot of reading and practicing. Eventually, I began charging for my services. I was working as a government contractor when I decided to quit my job and give it a go full-time. I had business, but not a ton of business, but I figured that it would grow as I did, too. When I moved to California from Georgia in 2012, I had extremely unrealistic expectations about running a business here. Saturated market, barely knowing anyone here… I had a few gigs, and donated some of my time to some great charitable causes, hoping that it would push my name out there to some folks. It did get pushed out, but the word “free” also got pushed out because of the work I did for military families and military homecomings. If “free” paid the bills, I could have made a killing. Two years into it, it simply wasn’t working. I couldn’t get anyone to hire me for family shoots (what I wanted to specialize in) so I opted to go a different route — weddings. I advertised with a well-known wedding-related group, but had a single inquiry (that did not result in me being hired) over a year’s time. Did I mention, I freaking hate weddings anyway? I would have done anything to stay in the industry at that point, though. My hopes of becoming a full time photographer that would be able to contribute to family bills were shot to hell. I tried everything that was within our means to make it work, but it simply wasn’t working, and we couldn’t fork out more money on the off chance that something would change. While my photography business was failing miserably, I was going to school full time, and I was also exploring other options. I figured that I already had the know-how when it came to design-related things, and I had enough of a diverse background from previous work & school experiences that it might be useful knowledge to apply. 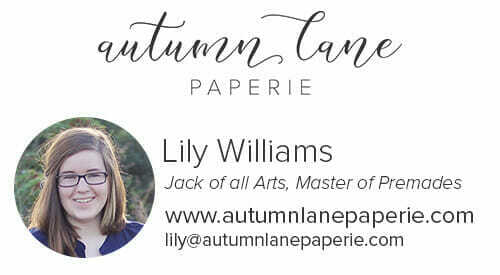 I began designing wedding suites, which then turned into Autumn Lane Paperie and what it is today. That’s not what this post is about, though! 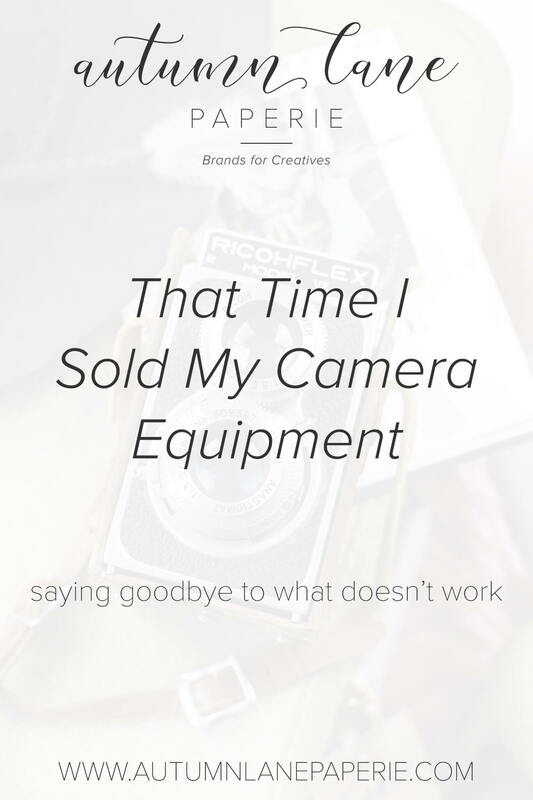 When my photography business finally croaked after a long, painful death, and Autumn Lane was doing well, I made the decision to sell off part of my photography equipment… A camera body, a few lenses, and some other implements. We met up with a guy who answered our Craig’s List ad for the equipment. He checked it all out, we checked his bills, and bam! I was pounds of photography equipment lighter! It was so bittersweet. I’d spent so much time, effort, and tears on that business. I put so much time into honing my skills, trying to put myself out there, and it just didn’t work. Selling off my equipment (I kept one body, the kit lens, and my 40mm) was also liberating. It was basically closing the door on something that had caused so much heartache. Yet, it paved the way for the thing that was working. Over those two years since moving to California, my passion for photography had dwindled into nothingness and frustration. Pulling out the camera to take pictures of the kids was even difficult and it was a chore. It was a chore to edit any images, too, because it felt like a reminder of my failure. What I learned from it is that it’s ok to fail. It sounds cheesy and like it’s some sort of line that some life coach or something would throw at you to make you feel better about your shortcomings…but it’s true. It was ok for me to fail, because I made it through. I’m not failing now. (I’d like it to stay that way, please.) When things didn’t work, I found what did, and I found something different to be passionate about. I learned that sometimes you need to know when to quit, move on, and cut out the negativity. Selling my camera equipment was freedom from that negativity. What happened after that is something that surprised me. I still had that other camera body & lenses, but I stopped taking it with me. I used to carry my camera everywhere with me, just in case I saw something cool that I felt I needed to capture. Eventually, I stopped carrying that camera with me, and it lived in a drawer under my desk. When I stopped carrying the camera, I stopped feeling obligated to capture every last moment. I started actually paying attention to those moments. It felt like I was more a part of every moment, rather than watching from the outside as everyone else had those moments. I was no longer concerned with catching that split second. This sounds cheesy, too, but…it was like I was living along *with* everyone, not through them. I’m that girl now, and I was wrong. Those people were living in the moment. It doesn’t matter if it’s 10 megapixels or a million, it’s still the best damn picture ever if it makes them remember that one time. It’s no secret that we run a family business & recently we’ve formalized what we’ve been doing more & more of in past months, which is working with Lily, our eldest daughter. Lily is an artistic amazement, given the fact that she comes from a family line of military, farming, medicine, & entrepreneurship. She has developed her natural ability to the point that she’s able to use it in commercial circles as a senior in high school. We’re thrilled to be able to work on a more consistent basis with Lily & we know that you all will enjoy interacting with her, too, as we continue to make changes at ALP for our growth & constant improvement! On that note, Lily has her own shops on Etsy & Creative Market, as well & was recently featured on Creative Market’s blog – check her out & show her some love! We’re so proud of you, Lily, & we love you! We work with a variety of people here at Autumn Lane – people across the country, people across the world! They’re business owners, creatives, & bloggers — lawyers, food critics, jewelry makers, photographers, real estate agents, candle & soap makers, and entrepreneurs of all types. Over the many miles & types of businesses we work with, the people behind the businesses and blogs share a few things in common: passion, the drive to succeed, and they’re quite protective of what they’ve started. We understand that here, because we’re protective of our business, too. Oh, look! There we are. This is one of my favorite pictures of us! I thought it might be nice for you to get to know *us* while we’re telling you a pretty raw, honest story about how this business was born. Autumn Lane started not too many years ago (August 2014), and it was very close to a last ditch effort on my part. In fact, it was so “last ditch” that I had an application filled out for the Starbucks down the road and ready to send in. I’d considered many other opportunities in addition to this, applied a few places (government & contracting positions) but none panned out. I looked into other local and remote opportunities that were available to me, and despite my education level, security clearance level, or qualifications, none really went anywhere. In fact, I had zero call-backs for any professional-level jobs despite my standing with my previous employer. Jeff was running his own landscaping company (and was also keen to learn of the opportunities to get back into government work) – while the landscaping (or “gardening” as they call it in SoCal) business was decent, it was expensive to run & keep up, and he was a one-man show out there making enough to pay the bills but not quite enough to hire someone. Rather than have him take on more clients, I felt like I needed to find a part-time job to help out financially while I was going to school. I’d dabbled in a few other things that didn’t quite pan out like I’d hoped after our move cross-country. I was a little hesitant to start something new given my less than stellar attempts before, but something about it just told me it was different. I was also a full-time student in graduate level courses, so it took up quite a bit of my time during the day. Working from home seemed like the most feasible “solution” to our situation, but it was pretty tense for a while. I was determined to find something that worked for us that met my “requirements.” I say “requirements” but it was really more of a wishlist. Ultimately, I wanted something that would pay enough to help with our bills, and allow me the opportunity to be available when our kids needed something. Whether it was school, summertime, or just having a parent around, I wanted to be there. When it just doesn’t seem to be working. Anyway, a conversation was had. I don’t remember the conversation, because I think a part of me blocked it out. It was a really rough time for our family, and for our marriage, to feel like we were financially about to be broken. I felt broken, too, because I was trying so hard to make things work. I was trying to manage family, school, and business…and the business side was just… *sad trombone* That’s the best way to describe it. The talent was there, but the interest in Southern California, not so much. I keep getting off track! The Conversation: The way Jeff tells it, he was standing on the stairs of our house, and he told me that maybe it was time for me to throw in the towel. He said I should just abandon the idea that I could work from home. I should give up on making my own hours while going to school and being there for the family. He says he told me—not in these same words—that I needed to come to terms with the fact that what I was doing wasn’t working. I apparently told him that I had no choice but to make it work, and that it was going to work. I would make it work. He left it at that, and didn’t touch it again. He told me recently (as we were discussing telling our story) that it wasn’t about what someone was offering, the products or services they had, or the way they were running their business. It was about determination and the drive to do it, and that my assertion that I would make it work, and had no other choice but to make it work was enough for him to leave it alone. 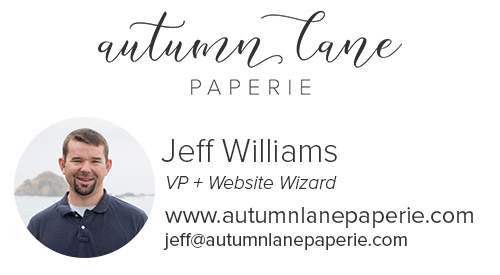 And, so begins Autumn Lane Paperie. A baby business, started on what many would consider to be high hopes and a whim, and an insane amount of determination and a huge will to make it succeed because I had NO other choice but to make it be that way. Hey guys! Today is a special day in the ALP house – it’s Beck’s birthday! Today she turns a young 25, as will be the case every year, lol. We’ll be spending the day enjoying each others’ company, complete with all 6 kids (one of whom is much furrier & upset that he can’t get into the pool). We’ll be back at work, tomorrow, though, for all of you guys! Thanks so much for trusting us with your business, you guys!